General Characteristics: Medium in height, erect, stocky, maturing within 9 to 12 months, producing from 10 to 15 oha; distinguished by the light self-green petioles and narrowly ovate leaf blades. Petiole: 65 to 90 cm. long, light green with indistinct greenish edge, white at base. Leaf blade: 45 to 60 cm. long, 35 to 50 cm. wide, 35 to 45 cm. from tip to base of sinus, narrowly ovate, medium green; piko light yellowish-green; veins rather conspicuous; lobes obtuse with wide sinus. Corm: Flesh white with yellowish fibers; skin white; roots conspicuously white. Inflorescence: Peduncle light green; spathe 26 to 37 cm. long, the lower tubular portion 4 to 5 cm. long, light green with faint tinge of purple at base, rather loosely rolled, the upper portion deep yellow, open near constriction and loosely rolled above; spadix 8 to 11 cm. long, the sterile appendage 9 to 14 mm. long, clearly constricted from staminate portion. Origin, and derivation of name: Native variety; the name is probably derived from the firm white corm flesh. Distribution: Quite common throughout the islands, under both wetland and upland cultures. Use: A commercial poi taro in certain areas on Oahu, making a good quality poi of grayish color. 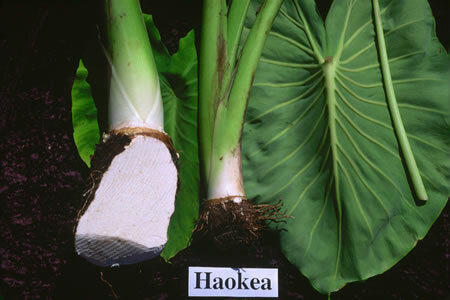 The young leaves are comparatively nonacrid and are used extensively for luau. Formerly, this taro was used as offerings to the gods, the luau being highly prized by the kahuna. It was also used quite widely for medicinal purposes.